The NASA-funded FOXSI instrument captured new evidence of small solar flares, called nanoflares, during its December 2014 flight on a suborbital sounding rocket. Nanoflares could help explain why the Sun's atmosphere, the corona, is so much hotter than the surface. Here, FOXSI's observations of hard X-rays are shown in blue, superimposed over a soft X-ray image of the Sun from JAXA and NASA's Hinode solar-observing satellite. Like most solar sounding rockets, the second flight of the FOXSI instrument - short for Focusing Optics X-ray Solar Imager - lasted 15 minutes, with just six minutes of data collection. But in that short time, the cutting-edge instrument found the best evidence to date of a phenomenon scientists have been seeking for years: signatures of tiny solar flares that could help explain the mysterious extreme heating of the Sun's outer atmosphere. 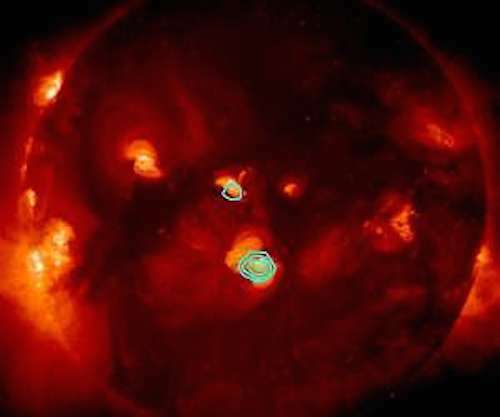 FOXSI detected a type of light called hard X-rays - whose wavelengths are much shorter than the light humans can see - which is a signature of extremely hot solar material, around 18 million degrees Fahrenheit. These kinds of temperatures are generally produced in solar flares, powerful bursts of energy. But in this case, there was no observable solar flare, meaning the hot material was most likely produced by a series of solar flares so small that they were undetectable from Earth: nanoflares. The results were published Oct. 9, 2017, in Nature Astronomy. "The key to this result is the sensitivity in hard X-ray measurements," said Shin-nosuke Ishikawa, a solar physicist at the Japan Aerospace Exploration Agency, or JAXA, and lead author on the study. "Past hard X-ray instruments could not detect quiet active regions, and combination of new technologies enables us to investigate quiet active regions by hard X-rays for the first time." These observations are a step toward understanding the coronal heating problem, which is how scientists refer to the extraordinarily - and unexpectedly - high temperatures in the Sun's outer atmosphere, the corona. The corona is hundreds to thousands of times hotter than the Sun's visible surface, the photosphere. Because the Sun produces heat at its core, this runs counter to what one would initially expect: normally the layer closest to a source of heat, the Sun's surface, in this case, would have a higher temperature than the more distant atmosphere. "If you've got a stove and you take your hand farther away, you don't expect to feel hotter than when you were close," said Lindsay Glesener, project manager for FOXSI-2 at the University of Minnesota and an author on the study. The cause of these counterintuitively high temperatures is an outstanding question in solar physics. One possible solution to the coronal heating problem is the constant eruption of tiny solar flares in the solar atmosphere, so small that they can't be directly detected. In aggregate, these nanoflares could produce enough heat to raise the temperature of the corona to the millions of degrees that we observe. One of the consequences of nanoflares would be pockets of superheated plasma. Plasma at these temperatures emits light in hard X-rays, which are notoriously difficult to detect. For instance, NASA's RHESSI satellite - short for Reuven Ramaty High Energy Solar Spectroscopic Imager - launched in 2002, uses an indirect technique to measure hard X-rays, limiting how precisely we can pinpoint the location of superheated plasma. But with the cutting-edge optics available now, FOXSI was able to use a technique called direct focusing that can keep track of where the hard X-rays originate on the Sun. "It's really a completely transformative way of making this type of measurement," said Glesener. "Even just on a sounding rocket experiment looking at the Sun for about six minutes, we had much better sensitivity than a spacecraft with indirect imaging." FOXSI's measurements - along with additional X-ray data from the JAXA and NASA Hinode solar observatory - allow the team to say with certainty that the hard X-rays came from a specific region on the Sun that did not have any detectable larger solar flares, leaving nanoflares as the only likely instigator. "This is a proof of existence for these kinds of events," said Steve Christe, the project scientist for FOXSI at NASA's Goddard Space Flight Center in Greenbelt, Maryland, and an author on the study. "There's basically no other way for these X-rays to be produced, except by plasma at around 10 million degrees Celsius [18 million degrees Fahrenheit]. This points to these small energy releases happening all the time, and if they exist, they should be contributing to coronal heating." "This particular observation doesn't tell us exactly how much it contributes to coronal heating," said Christe. "To fully solve the coronal heating problem, they would need to be happening everywhere, even outside of the region observed here."